View to Cap Canaille from infinity pool at newly refurbished 5 star hotel Les Roches Blanches in Cassis, sampled by tour operators attending RDVF 2019 in Marseilles. Now Boeing say they have fixed MCAS will regulators believe them? Was Boeing’s lethal MCAS designed to deliver the 737MAX early to market? 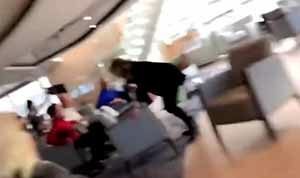 A cruise ship in trouble provided a viewing frenzy for online video, happily all 1,400 passengers were evacuated from Viking Sky off the Norwegian Coast while the world watched the live streams. See some highlights here and here. The Limerick Travel Show in connection with Shannon airport has been confirmed for the UL sports hall on January 11 and 12 2020, a week in advance of Belfast Holiday World and two weeks in advance of Dublin Holiday World. Watch video diary here of the 2018 show and see more pictures here or connect with the album on Facebook. 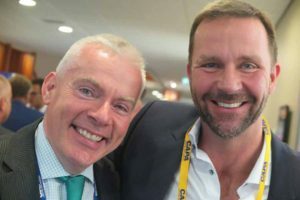 Irish lessors BOC and Sky Aviation (whose two WOW aircraft are a favourite with plane spotters because of their reg numbers, TD-DOG and TF-CAT) were left scrambling to reclaim aircraft as WOW Air ceased flying on Thursday, following the breakdown of talks with Icelandair and investment firm Indigo Partners LLC, owners of Wizz. BOC grounded a WOW aircraft in Montreal in Monday, as CEO Sculi Mogensen’s plans began to unravel. Sculi apparently believed he would find a white knight right until Thursday at 8.30 when the fleet was grounded, the airline was taking bookings until 7am and even rescheduling passengers who were learning the 835 from Dublin was cancelled. Skúli Mogensen wrote to employees: “I will never forgive myself for not acting sooner. Wow was clearly an incredible airline and we were on the path to do amazing things again.” Wow had reduced their fleet from 20 to 11 as they ran out of runway, three of the 11 are leased out of Ireland and six out of Los Angeles.Late on Thursday, Aer Lingus offered ‘rescue fares’ of €169 each-way for WOW customers booked after April 12, call 1890 800600. Picture shows Skuli in happier times, with Niall McCarthy after announcing the short-lived Cork-Keflavik service in 2016. 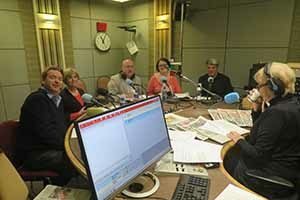 Éist anseo le Eoghan Corry, eagarthóir Travel Extra ar Tús Áite ar Raidio na Gaeltachta. Listen here to Eoghan Corry on RTE News at One talking about the Wow Air Collapse and Boeing’s 737MAX software remedy and watch here on Virgin media news. Boeing vice president Mike Sinnett unveiled what the company heralded as a fix for the MCAS “40 seconds to unrecoverable dive” system in Seattle, now activated by input from two sensors instead of a single one, scheduled to operate only once, not multiple times, and a provision that, if the sensor reading remains stuck at a high value, the power of the system will be limited so that the pilot will always pull back on the control column with enough force to counteract any automatic nose-down movement. As has been pointed out even before Ethiopian Airlines Flight 302, MCAS can be countered by the pilots and, if all else fails, can be turned off by flipping two cutoff switches. Even the test pilot was unaware if the full MCAS was single channel. Former Boeing engineer Rick Ludtke said managers mandated that any differences between previous 737 and the 737 MAX had to be small enough that they wouldn’t trigger the need for pilots to undergo new training or simulator time, “which was off the table.” Asked if the group had built the MCAS in a way that would depend on two sensors, and would shut the system off if one fails, he thinks the company would have needed to install an alert in the cockpit to make the pilots aware that the safety system was off. Acting administrator of the US Federal Aviation Administration Daniel Elwell defended the agency’s practice of relying on aircraft makers to help certify their own planes for flight by saying the strategy has “consistently produced safe aircraft designs for decades” and changing it would said the agency would require 10,000 more employees and an additional US $1.8bn a year. TAP Portugal‘s twice daily service to Lisbon commences today, March 31st, with the interesting offer of free stop overs in Lisbon. TAP’s A319 service, TP1325@10.35 and TP1327@17.30, will fill the void left by the long-established Madeira charter, and serves the Azores which had direct flights from Dubin in 2006 and 2007. Carlos Oliveira says 30pc of advance bookings are connecting through Lisbon and he expects that proportion to grow. Brazil, Ponta Delgada, Terceira, Funchal and Porto Santo featuring a network of 89 destinations in 35 countries. TAP offers full service in business and economy class, with Portugal menus and Portuguese wines. 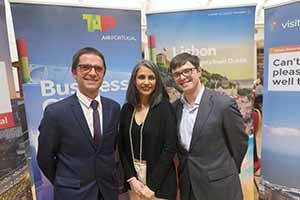 Picture shows Fernando Pires of Alentejo Tourism, Susana Cardoso Director of Portuguese Tourism office in Dublin and Carlos Oliveira of TAP at the Irish Travel Trade Show. The lovely Rachel Lewis of South African tourism and tour guide Siseko Yelani of Uncuthu Tours – one of 11 faces showcasing the nation – hosted a group of Irish travel writers in the Eastern Cape, taking in the city of Port Elizabeth, Mount Camdeboo Private Game Reserve, the tourist towns of Graaff Reinet and Nieu Bethesda. 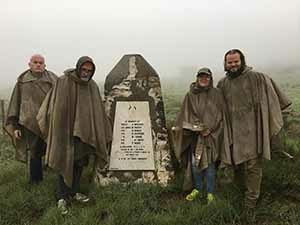 Picture shows a rain-sodden visit (during an otherwise scorching trip) to Paardefontein Boer War battlefield site for Mark Evans of Travel Extra, Jim Murty of the Irish Daily Mail, Isabel Conway and Iain Buchanan, owner of the reserve. And best wishes from all at Travel Extra to Isabel Conway. One of the victims of the country’s sporadic power cuts, she broke a toe bumping in to an antique dresser in the dark in her palatial room at Mount Camdeboo Private Reserve. Forget about the cheethahs and rhinos – it’s the furniture that bites in these parts. Cruise line representative group CLIA will host a Dublin cruise showcase on July 26 onboard Azamara Club Cruises’ Azamara Journey, open to all Irish travel agents, including non-CLIA members. Register here. Princess Cruises is to host 350 Irish agents during 12 separate ship visits in Dublin, Cork and Waterford this summer, nine on the 3,080-passenger Crown Princess, in Dublin and Cobh from May to September, two on the 3,560-passenger Regal Princess in Dublin and Cobh during early September and one on the 670-passenger Pacific Princess in Waterford in September. Agents wishing to take part in a ship visit can register here. 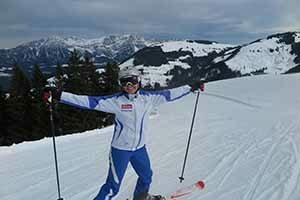 The International Ski Travel Market (website) was hosted by Anita Baumgartner (pictured) and her team at Sportresort Hohe Salve in Hopfgarten, one of the nine villages of the SkiWelt, with a fam trip to Ellmau, hosted by SkiWelt Marketing and the Tirol Tourist Board. SkiWelt promised lots of investment in new lifts and systems this winter yet again. Skiwelt’s capacity is 146,000 skiers per hour, and 3m over a winter season. SkiWelt closes this weekend but some resorts are opening right through until May of this year after thirty-year record snowfall. Attendance included Aileen Eglington from AE Consulting and Elisabetta Gutterer from Trentino Italy, well known in Irish travel and media circles. A delegation from Western Massachussets, the other side of Aer Lingus’s successful Hartford route, are in Kerry this weekend for the Dingle summit. They visit the Blaskets, many of whose islanders settled in Springfield, local tourist attractions and an official event with Minister Brendan Griffin and Mayor of Kerry Norma Moriarty and Kerry Council CEO Moira Murrell, before departing for trade and media events in Dublin. Picture shows the group in the Skellig Hotel: Gene Cassidy of Eastern State Exposition, Alicia Szendo of Greater Springfield CVB, Michelle Goldberg of Greater Springfield CBVB, Caroline Boland of Dingle Tourism Alliance, Paul Lambert of Springfield Basketball Hall of Fame, Jean of Forest Park Springfield, Laurie McDonald of Yankee Candle Company, Eoghan Corry editor of Travel Extra and Gillian Palmer of the Big E.
Last time they had a referendum without a debate. Now they are having a debate without a referendum. Listen here to Travel Extra‘s Eoghan Corry on RTE Marian Finucane contributions on John Delaney, negative equity, immigration, Breatimeacht/Brexit, the cap on cruise ships at Dublin port and Boeing’s 737 MAX groundings. The full panel also included David McWilliams, Mary Whelan, former Diplomat, John O’Brennan of Maynooth University and Jeanne Kelly solicitor, with LK Shields. Listen here to the excerpt on the cap of 80 cruise ships at Dublin port and Boeing’s 737 MAX groundings. 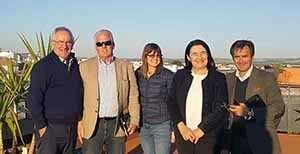 Picture shows Pat Dawson CEO of the ITAA, Des Abbott of Des Abbott Travel, Jean Maxwell of the ITAA, Teresa Gancedo Director of the Spanish Tourist Board in Dublin and Antonio Martin of Andalusia Tourism, on an inspection mission to Cordoba in advance of the ITAA Conference on October 18 2019. Subject to confirmation, the conference will take place at the 5 star 162-room Eurostars Palace (website) situated between the new town and old centre of Cordoba, complete with rooftop bar (flashbacks to Granada 2013). Conference content will include a suppliers forum to discuss relationships on trading and updates from IATA and ECTAA. Travel Extra’s Eoghan Corry has been confirmed as moderator for the conference. 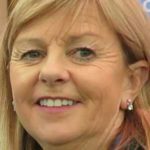 GoHop group appointed Ann Marie Durkin as leisure travel manager. She previously held senior roles with American Express, Omni Travel and most recently Cassidy Travel. Experienced sales consultants interested joining GoHop team are invited to send a CV in confidence. CSO figures for overseas trips made by Irish residents during February 2019 were up 13.0pc to 556,300. 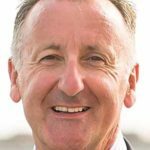 Martin Penrose is departing If Only, months after Martin was shortlisted in the competitive supplier representative of the year at the travel industry awards, as the Scottish based tour operator downsizes its operations. It does not augur well that their letter to the trade said agents in “southern Ireland” would continue to be supported. Ethiad Airways and the Abu Dhabi Department of Culture & Tourism joined forces to host 78 key travel in Ten Square Hotel in Belfast on Wednesday and 117 trade at The Loft in Dublin on Thursday March 28th for a night of food, sparkling wine, music and update on Abu Dhabi. From June 27th to September 15th Etihad will be increasing their 7 B787 weekly flights to 11 per week. The event highlighted Abu Dhabi as a cultural and beach holiday destination: the 9km white sandy beaches of Saadiyat, the new Louvre and proposals for a Guggenheim museum. The Jumeirah, Rixos and Rotana showcased their 4 – 5 star accommodation and offered prizes to attendees on the night. 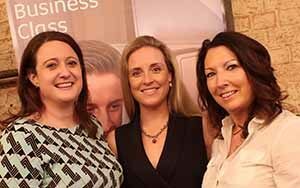 Picture shows Gina Liuzzi, Shannon O’Dowd and Karen Moloney of Etihad who co-hosted the Destination Abu Dhabi event with the Abu Dhabi Department of Culture and Tourism. See video slideshow here of the event. See more pictures here or connect with the album on Facebook. Picture shows tour operators attending RDVF 2019 in Marseilles at the newly refurbished 5 star hotel Les Roches Blanches in Cassis:. Maxime Yehouetome of Klook Travel Netherlands, Anne Courcier of Snowventures Sedona USA, Alex Blanc Vea of Marseilles Tourism, Sashko Donchovski of Atlantis Travel Macedonia, Manish Kripalani of Baywatch Travels Chennai, Tina Kanuga of Bathija Travels Mumbai, Anton Ikannikov of KMP Travel Russia, Andres Serrano of Contiviajes Ecuador, Loïc Lastapis of Les Roches Blanches. 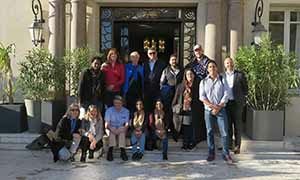 Front row: Isabel Nicolas of Hautes-Alpes Tourism, Michelle Vallet of Cassis Tourism, Eoghan Corry editor of Travel Extra Ireland, Madhuri Kanga of Ahura Travels Mumbai and Hutokshi Marker of Trail Blazer Tours Mumbai, Cassis. Watch here Travel Extra Tv video diary of RDVF 2019@Marseilles. Rome International Skal Golf Challenge, a tournament open to all worldwide Skal members, takes place on Saturday, May 4th 2019 at the National Golf Club in Sutri (HQ of the Italian Golf Federation), north of Rome. Watch here Travel Extra TV video diary of the Irish Travel Trade Show in the RDS.. Sad news: Eamonn Murray, group leader with Marian Pilgrimages, has died. For more images from our galleries .See more pictures here or connect with the album on Facebook. United Airlines said flight attendants scheduled to work popular long-haul routes to cities like Sydney, Singapore or Tokyo are supplementing their income by selling them to colleagues who are willing to pay. This comes weeks after, United fired 35 employees for alleged abuse of travel perks such as selling their staff and family travel passes to the paying public. Police say they executed a search warrant at the offices of the Las Vegas Convention and Visitors Authority as part of the investigation into misuse of Southwest Airlines gift cards and arrested Brig Lawson, former director of business partnerships on a felony theft charge. Trump Hotels launched White House themed merchandise, tee shirts and mugs emblazoned with an image of the White House bearing the Trump name or the Trump International Hotel and other political symbols around Washington DC, such as the Lincoln Memorial and the Jefferson Memorial. Portaventura opens next Saturday, April 6 and will be open 10-19.00 changing to 23.00 in june and 24.00 in July. Alton Towers reopened last weekend, and will open from 10 am until 4 pm on low season weekdays then 10 am until 5 pm on weekends and busier weekdays with summer opening hours of 10am-6pm, with Scarefest and Fireworks remaining 10 am till 9 pm. Minister Simon Coveney said the 230,000 applications for Irish passports to March was up 30pc on last year. Sesame Street at Seaworld opened to the public last week, featuring Abby Cadabby’s Garden, Big Bird’s Nest, Mr. Hooper’s Store and the123 Stoop. Scotland used the (alleged) Brexit day to launch their new tourism campaign: “Europe, let’s continue our love affair”. The Restaurants Association of Ireland regional awards concluded with the Connacht awards at the Radisson Blu, Sligo, Monday night, with the restaurant awards won by Loam in Galway, The Cottage in Leitrim, Mayo: Cian’s on Bridge Street in Mayo, The Yew Tree in Roscommon and Eithna’s By the Sea in Sligo. They join winners in Leinster, Munster and Ulster and the Dublin nominees in the grand final on May 13 in Dublin. Michelin Star Executive Chef Hywel Jones will be hosted by Head Chef of Adare Manor’s fine dining Oak Room restaurant, Mike Tweedie for private kitchen demonstration, which includes a special three course luncheon in The Carriage House Terrace on Sunday 29th April, and on Monday, 30th April. The Doran family are selling the Old Stand pub in Dublin to Eamonn O’Malley for €3m. Dave Egan has sold Bruxelles to Louis Fitzgerald for €10m. Wolf Inns has purchased the Bellevue Arms in North Belfast for £3m and plans a £250,000 refurbishment of the restaurant and beer garden. Mercantile Group appointed Shane Treacy as managing director. Beannchor is investing £500,000 in a revamp of The Cloth Ear bar in Belfast’s Merchant Hotel. Salamanca Tapas Bar & Restaurant won restaurant of the year and Kavanagh’s Naas bar of the year at the Irish Hospitality Awards in the Crowne Plaza Hotel on Monday night. 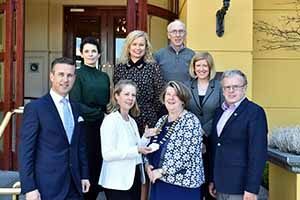 Leading hotel in Ireland for six of the past seven years of the TripAdvisor Readers choice awards, Harvey’s Point has been sold by owners Deirdre McGlone and Marc Gysling to Davy Real Estate for a reputed €18m. In extracts from a wide ranging interview with Travel Extra in 2013, Deirdre McGlone talks about how it all started with 20 rooms and Thierry Delacroix (listen here), her early life and travels and travails in France (listen here), how Jody Gysling fell in love with Donegal (listen here), how Harvey’s Point got its name (listen here), expansion in 2005 that “changed the game” for Harvey’s Point (listen here), talked about the fundamentals of the hotel business (listen here), “We were surprised by our success,” she says (listen here), how It comes down to personal welcome (listen here), building the team at Harvey’s Point (listen here), how the Back of House matters a lot in hotel industry (listen here), the importance of breakfast (listen here), how they earned a reputation as a destination for couples (listen here), and for food: “food is what we do” (listen here), Lough Eske in Donegal and its allure (listen here), that hotelier’s nightmare, the white elephant function room (listen here), managing Tripadvisor reviews as a hotelier (listen here), and the importance of keeping your identity in the hotel business (listen here), down to hotels an age when receptionists don’t look up (listen here) and hotels are being judged on size of the spa (listen here). 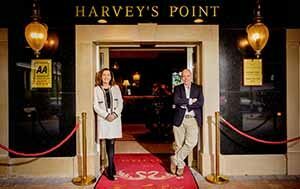 Harvey’s Point hotel’s success she summarises as Swiss precision made in Ireland (listen here). Picture shows Mark Gysling and Deirdre McGlone of Harvey’s Point. John Malone’s MHL is to acquire the Powerscourt Hotel from Sugarloaf Investments subject to approval from the Competition and Consumer Protection Commission to become their 12th hotel in Ireland and fourth five-star after the InterContinental, Westin and Glenlo Abbey. 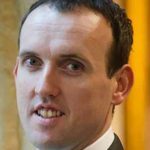 Mount Juliet Estate, where Mark Dunne (pictured) is the new GM, has become Ireland’s 42nd five star hotel, accredited across its two properties, the 32-bedroom Manor House and newly-opened, 93-bedroom Hunter’s Yard hotel. The Lady Helen restaurant already has a Michelin star. Ireland’s updated list of 42 five star hotels accredited by Fáilte Ireland and TourismNI is: Adare Manor, Aghadoe Heights Killarney, Ashford Castle Cong, Ballyfin Demesne Laois, Castlemartyr Cork, Cliff House Ardmore, Conrad Dublin, Dromoland Castle, Druids Glen Wicklow, Dunloe Killarney, Dylan Dublin, Europe Killarney, Fitzwilliam Belfast, Fitzwilliam Dublin, Fota Island Cork, G Galway, Glenlo Abbey Galway, Hayfield Manor Cork, Heritage Killenard, Holyrood Co Down, Hotel Dunloe Castle, Inter Continental Dublin, K Club Straffan, Killarney Park, Lough Erne Fermanagh, Lough Eske Castle, Lyrath Estate Kilkenny, Marker Dublin, Merchant Belfast, Merrion Dublin, Monart Destination Spa Wexford, Mount Juliet Kilkenny, Muckross Park Killarney, Park Kenmare, Powerscourt Wcklow, Radisson Blu St Helens Dublin, Savoy Limerick, Sheen Falls Lodge Kenmare, Shelbourne Dublin, Westbury Dublin, Westin Dublin, Trump Resort Dunbeg. Bernadette Randles of Dromhall Hotel, Killarney accepting the chair of Office from Niamh O’Shea, outgoing, accompanied by Padraig McGillicuddy, Ballygarry House Hotel, Tracey Coyne, The International Hotel, Breffni Ingerton, The Gleneagle Group, Padraig Treacy, Kilarney Park Hotel, Emer Corridan, The Cahernane Hotel and Mike Rosney, Killeen House Hotel. Planning permission has been denied for a proposed 71-bedroom hotel in Enfield, Co Meath. Galgorm Spa & Golf Resort will offer a new country cottage accommodation offering from April 1. Ger Alley (pictured) has been appointed general manager of The Heritage Killenard. 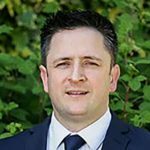 Andrew Kavanagh has been appointed group sales and marketing manager for FBD Hotels. An independent valuation of Dublin’s Red Cow Moran Hotel by Savills increased the hotel’s book value to €48.5m from €26.2m. PwC Hotels Forecast said Belfast room rates average €93/£80 behind only London, Edinburgh and Brighton in the sterling zone. Fergus O’Donovan of Radisson Blu (pictured) won GM of the year, Annebrook House Mullingar best hotel, Powersourt resort of the year, Blue Haven Kinsale boutique hotel, Silver Tassie Letterkenny hotel team and Cartron House Farm, Ballinakill the B&B award at the Irish Hospitality Awards in the Crowne Plaza Hotel on Monday night. The Park Hotel Dungarvan will add a new €500,000 ballroom in mid-2019. 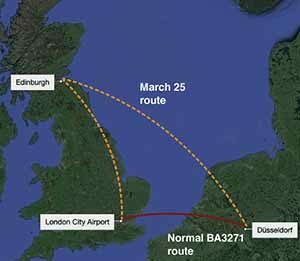 Norwegian‘s Dublin to Hamilton 4w service to commence today will be the airline’s first-ever route between Europe and Canada. Ryanair is to add a route from Alicante to Cork next winter as well as Berlin Tegel, Haugesund in Norway, London Southend 5w, Marseille, Porto and Toulouse 2w to grow 14pc to 4.9m passengers. As first reported by Travel Extra, Great Dane confirmed it will become Dublin’s 56th airline with a Dublin-Aalborg E190 route 2w June 21 to July 26 and daily to October. Cork airport has opened a new Airport Control Centre and purpose-built office suite, The Hub, with three operational departments Airport Police Control, Airport Duty Managers and the Airside Management Unit and upgraded technology and IT systems including CCTV monitoring of the airport campus, 24-hour newsfeeds and flight information, police control, and alarm master stations. 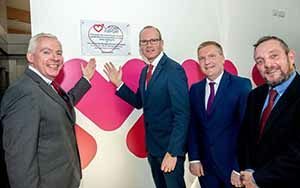 Picture shows Minister Simon Coveney with Niall MacCarthy, Michael McGrath and Senator Jerry Buttimer at the official opening. Etihad Airways is to expand its codeshare network with Aer Lingus to cover additional 11 routes: Dublin-Bilbao, Bologna, Bordeaux, London City, Gatwick, Milan Malpensa, Minneapolis/St. Paul, Munich, Palma, and Santiago de Compostela & Zurich. Nine Dutch pilots are demanding €1m each from Ryanair due to the closure of its base in Eindhoven as compensation for harassment and compensation for loss of income if they go to work for another company and have to start at the bottom of the seniority ladder. Michael O’Leary said Europe’s airline industry is moving “inexorably” towards five airline groups –Lufthansa, IAG, Air France-KLM, Ryanair and easyJet, controlling 80pc of the continent’s traffic, and predicted the purchase of Norwegian and TAP Air Portugal by IAG, the sale of Wizz Air to Lufthansa, and Alitalia’s eventual acquisition by Air France-KLM. The Government lost a Dáil vote on the Aircraft Noise(Dublin Airport) Regulation Bill with added amendment “The competent authority shall direct the airport authority to ensure that average noise exposure is reduced below 45dBL, and night noise exposure below 40dBL, such levels to be revised in accordance with WHO guidelines.” The amended Bill was passed 66 to 28, FF voting for. It is now before the Seanad. 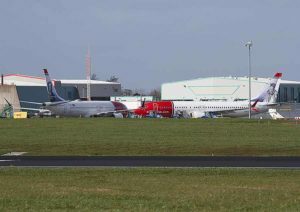 DAA was told by Fingal County Council to provide a flood-risk assessment and more information on surface water drainage about plans to reduce the number of taxiways and relocate as part of its €320m runway project at Dublin Airport, including the relocation of electricity sub-stations, a new perimeter fence, and the installation of airside blast -protection fencing. The total paved area at the airport following construction of the runway is to be significantly reduced under the changes being sought by DAA. DAA has previously said that the changes to the runway project primarily relate to changes in aviation standards and compliance regulations. The Irish Airline Pilots’ Association claimed in a lengthy submission to the council that that the redesign of the taxiways “radically compromises the safe, efficient flow of aircraft”, and “creates congestion“. It has also claimed that the length of the new runway – at just under 3.2km – is “sub-optimal“. Turkish Airlines will start its moving operations from Atatürk Airport on 6th of April 2019 at 02:00 (LMT) in order to carry out all scheduled flights from Istanbul (New) Airport. Once the moving operations completed as of 6th of April 2019 at 14:00 (LMT), all scheduled flights will be carried out from Istanbul (New) Airport. As of 6 of April 2019, Istanbul (New Airport) will be displayed with IST code across reservation systems. Dublin Airport is taking part in a trial that uses biometrics to help passengers travel between two airports in conjunction with Bristol Airport and an airline partner, the first biometric trial that enables passengers to use the same biometric system at their departure and arrival airports and with their airline. In Perth to mark the first anniversary of the Qantas London to Perth service, Alan Joyce said 61pc of passengers are from Australia, 31pc from other countries. Qantas has seen a 30pc increase in passengers travelling between London and Australia via Perth, and a 7pc increase inbound. Load factor is 94pc, average flight times are 16 hours and 5 minutes, with the fastest flight being 15 hours and 15 minutes. Most popular meal in Business Class is Cone Bay Barramundi and the Beef and Yorkshire Pudding, and Guinness beef pie with potato mash in economy. Deloitte Access Economics said the route generated $100m in free publicity and drove 1.1m visitor nights in W Australia. 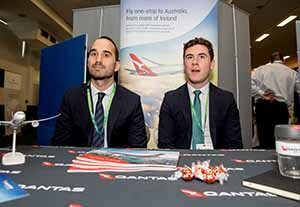 Picture shows Pauric Gallagher and Andrew Hall of Qantas at the Travel Industry Trade Show. Belfast International is on course for 6.8m passengers in 2019 with February figures were up 17pc for the month to 446,116 and 9.8pc for the rolling year. Derry was down 7pc to 13,865. Royal Caribbean is to offer an aircraft, Master of the Skies, complete with a ‘slide in the sky’ in its family suite, to premium guests. Regent Seven Seas Cruises enhancements include a doubling of internet bandwidth and free valet laundry service for master and grand suite guests. Virgin Voyages will include a record shop and a Japanese-style karaoke room on Scarlet Lady, its new ship set to launch in spring 2020. Carnival Cruise Line launched a yearlong initiative called WUATA: Why Use A Travel Advisor. Celebrity Summit re-emerged from her refurb with redesigned staterooms and suites, a new sundeck and redesigned lounge: The Retreat for suite guests, redesigned restaurants, bars and lounges, spa and casino. Seabourn has partnered with virtual reality solutions provide Pixvana, for provide “TableVision”, a virtual reality training solution for waitstaff. TripAdvisor named Ireland’s premier destinations in its reader’s choice award: 1 Dublin, 2 Killarney, 3 Galway, 4 Dingle, 5 Cork, 6 Kilkenny, 7 Cong, 8 Westport, 9 Donegal town, 10 Sneem. London rose from second place in 2018 to become the world’s number one destination ahead of 2 Paris, 3 Rome, 4 Crete, 5 Bali, 6 Phuket, 7 Barcelona, 8 Istanbul, 9 Marrakech, 10 Dubai. As Travel Extra website points out, the list seems to follow closely Ireland’s most visited locations and ones with premier hotels. CSO figures for February showed visits from Britain down 14.2pc on the pre-referendum February 2016 figure and down 2.0pc on February 2018. Trips to Ireland are 2.7c for the month and 7pc for January-February, Europe up 3.4pc, N America up 9.0pc and other up 22.6pc. First held in 1975, Meitheal 2019 hums into action at Citywest Hotel on Tuesday 2nd April & Wednesday 3rd April, with a new focus on the Business Tourism by the Irish trade, with international business events and conference planners from the US, Canada, Britain, France and Germany attending. The event sees 600 Irish tourism businesses pitching to 300 international buyers and tour operators from 20 countries. Fáilte Ireland and Coillte announced plans to re-develop Avondale House and Forest Park into an #8m visitor attraction of which Fáilte Ireland will contribute €6.1m. 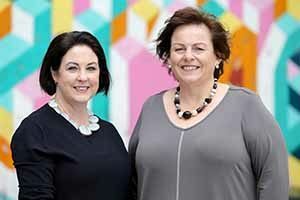 Picture shows Brenda Morgan of BA, chair and Joanne Stuart, newly appointed CEO of the NI Travel Alliance, which is set up on a similar basis to ITIC to act for the tourism industry in the north. Tourism Ireland teamed up with Italian tour operator Francorosso in a campaign that includes video ads on social platforms, including Facebook and Instagram; email marketing; and display ads on travel websites. Tourism ventures Gorey Visitor Centre, Ireland’s Medieval Mile Pass in Kilkenny, the Mid-West Lean Network, See Something Say Something in Tralee and Waterford Chamber Regional Leaders Programme are short listed in the Irish chambers awards next weekend. 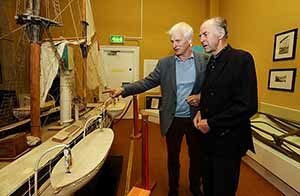 Picture shows explorer Ranulph Fiennes, who spoke at Kildare chamber last week, examining the Shackleton exhibit in Athy museum with Jonathan Shackleton. 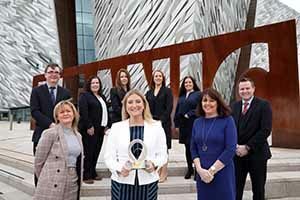 Picture shows TBL International Directors, Judith Owens, Siobhan Lynch and Michele Scott celebrating the EFQM Excellence Ireland Award with Titanic Belfast’s Senior Executive Team. Twenty years after being assaulted in Ireland as a 17 year old Italian student, Guido Nasi, will meet President Higgins at Áras an Uachtaráin, April 1st@ 11:30, at a special event to mark the 25th anniversary of the Irish Tourist Assistance Service, ITAS is the only dedicated national service in Europe offering specialist support to tourists who experience crime while holidaying. Newbridge Silverware has dropped its €7 charge into its 350,000 visitor per annum museum, which is free again. The newly launched factory tour (45 minutes) costs €12. Bunratty Castle won tourist attraction of the year at the Irish Hospitality Awards in the Crowne Plaza Hotel on Monday night. Alarm bells: a BirdWatch Ireland survey shows wintering waterbirds have declined by 500,000 or 40pc in twenty years. 4* Hotel La Pergola, (B&B) Sant’ Agnello, Sorrento. Sale Price £599pps. 7th June 2019. 4* Garda Village, (S/C) Sirmione, Lake Garda (Family Option) Sale Price £479pps (Based on 4 sharing) 8th June 2019. Fly from Cork: 4* Hotel Principe Palace (H/B), Lido di Jesolo. Sale Price €799. 8th June 2019. Non -sale price €1069 Save €270 4* Garda Village, (S/C) Sirmione, Lake Garda (Family Option). Sale Price €549pps (Based on 4 sharing). 1st June 2019. Non-sale price €730 Save €181 4* Hotel Villa Dirce (H/B), Limone, Lake Garda. Sale Price €819pps. 1st June 2019. 4* Hotel Splendid Palace (H/B), Limone, Lake Garda. Sale Price €769. 8th June 2019. All prices above include return flights from the airport as stated, based on 2 persons sharing unless otherwise stated, return transfers, accommodation for 7 nights, taxes and Topflight’s in resort service. Call Topflight on 01 240 1700 (ROI) or 028 9752 1168 (NI). See www.topflight.ie or topflight holidays.co.uk. Visit your local travel agent. Best of Germany with Insight Vacations. 14 Days – Visiting: Germany. Price NOW: from €2,439 per person sharing, including flights, transfers, and 9 nights accommodation in central locations, 9 breakfasts, 4 dinners with wine and 17 included experiences. Departs 30th August 2019. Flight cost must be paid at the time of booking. For more information log onto https://www.insightvacations.com or call 01 775 3803. Enchanting Danube with Uniworld Boutique River Cruises: Classic stateroom. 8 Days from Budapest to Passau. Price Was: €3,749 per person sharing. Price NOW: €2,949 per person sharing, including flights, 7-night cruise in a riverview stateroom onboard the majestic S.S. Maria Theresa, airport transfers on arrival and departure days, all meals onboard, unlimited beverages onboard, 6 days of excursions, all gratuities and more. Departs 11th August 2019. Sunway Offers: Sunway Escorted Tours. Rhythms of the South. From €2,035pp. Departs 16th September 2019. Price includes flights ex Dublin, 20kg bag per person, taxes, 9 nights twin share 3* hotels, some meals and tours as per itinerary. Subject to availability and change. SunwayRiver Cruise: 5* Celebrate New Year Eve on the ‘Enchanting Rhine’ fly to Basel and return from Amsterdam. From €2489pp. Depart Dublin 30th December. Includes flight ex Dublin, return port transfers, 7 nights twin share in an outside stateroom with fixed window, unlimited wine/beers at meals, sip and sail daily cocktail hour & daily complimentary excursions. Not included gratuities and port charges of €150pp. Includes early booking reduction of €600pp. Subject to availability and change. Sunway Club Med:All Inclusive Ski 2020, Aime la Plagne, 3T, France. Adults from €1,3495pp and children from €1105pp. Departs 5th January 2020. Price includes flights ex Dublin, 20kg bag per person, resort transfer, standard room triple share, all -inclusive for 7 nights, 6 day lift pass and 5 full days ski tuition. Includes early booking discount of €664.00. Subject to availability and change. MSC Lirica. Sailing from Rome. 6 nights. Includes 2 nights Rome, 3 night cruise plus 1 night Venice. Drinks Included. From €799pp. Departs 21st July 2019. Departs 5th May 2019, 7 Nights. Sailing from Barcelona. From €1099pp. Departs 5th May 2019. Montenegro & Greece Fly Cruise – Norwegian Star. 7 Nights. Sailing from Venice. Premium All Inclusive from €1595pp. Departs 15th September 2019. Bahamas & Virgin Islands Fly Cruise. Regal Princess – 8 Nights. Sailing from Fort Lauderdale. Includes 1 night pre cruise hotel stay plus 7 night cruise. From €1145pp. Departs 7th December 2019. Dublin to Norway Cruise – Celebrity Reflection. Departs 26th May 2018, 8 nights. Sailing from Dublin *No Flights Needed* From €1069pp. Departs 26th May 2019.